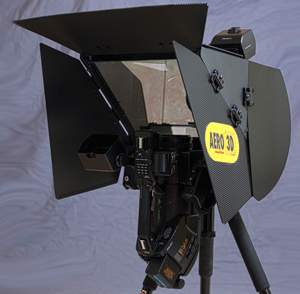 Aero3D™ is designed to provide extreme rigidity in a lightweight package and Indy pricing $5795 list - $3995 special NAB introductory pricing. 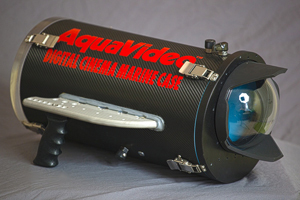 AquaVideo™ manufactures high quality, fairly priced underwater housings (underwater cases) for virtually any camcorder; specialized cameras for commercial diving, scientific, and industrial use - as well as some digital still cameras. Housings for most single chip camcorders are $1399 - $2999. Housings for highend cinema and broadcast cameras range from $4,999 - $25,000. Aquavideo™ housings feature dome port optics, patented x-ring double seals, excellent visibility of the LCD screen, and much more. ••• Click here for details. Underwater Lighting: AquaVideo's SuperNova 250 and 350 watt tungsten halogen lights have been the industry standard for quality, reliability and high power for over 20 years. Although our 50/60 watt HID brought SuperNova™ quality to the HID market, recent improvements in our halogen lights make them an excellent choice for users seeking the purest possible colorimetry. A new line of very compact high-powered LED lights are on the way. Our Underwater Lighting Guide sorts fact from fiction. Click here for more info. Rental Equip. & Production Services: AquaVideo is your best source to rent U/W video and lighting equipment. Housings are available for many of the more popular prosumer 3-chip Standard and HiDef camcorders, and broadcast cameras like the Sony F900 and Panasonic Varicam HD camcorders - and an Ikegami 16:9/4:3 camera/housing package. We also rent abovewater camcorder packages; a broadcast quality live switching "flightpack"; multiple broadcast box-type cameras with remote pan/tilt control; professional audio mixers, amps, speakers and video projection - for live events, conventions, concerts, etc. We also supply underwater and abovewater operators. AquaVideo... the name speaks for itself. AquaVideo is underwater video. 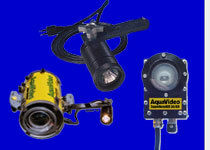 In 1981, AquaVideo was the first company to manufacture and market self-contained undewater video systems. Since then we have manufactured custom-fitted housings for 300+ different video systems of all sizes and shapes from consumer camcorders to Broadcast Betacams, and created more than 40 standardized designs for the most popular equipment. 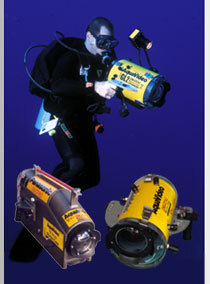 Today, AquaVideo continues to be the leader in underwater video technology. AquaVideo's client list of companies that have purchased AquaVideo underwater housings and lights reads like a who's who of dive professionals, government agencies, major corporations, and virtually all of America's major oceanographic institutes. National Oceanic & Atmospheric Assoc. Jim Abernethy's Scuba Adventures, Inc.
AquaVideo Manufactures housings for a wide variety of cameras, often semi-custom with rapid turnaround. The following is a short list of representative housings and prices.